Tanya O’Conner with Rosie Myers. 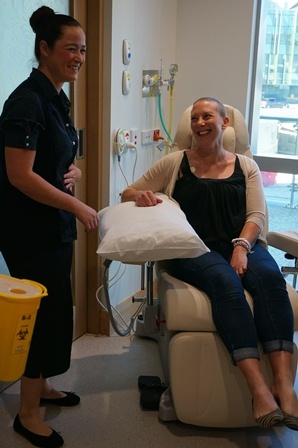 At St John of God Murdoch Hospital’s Oncology Clinical Trials Unit (MOCTU), patients are experiencing fewer of the side effects of chemotherapy from a new trial treatment for breast cancer. Patient Rosie Myers, who had early stage breast cancer, says the trial drugs have given her a new lease on life after enduring the effects of standard chemotherapy. Rosie, a criminal lawyer, had a mastectomy in February, followed by standard chemotherapy and started the trial in June. She is now taking a combination of the drugs Perjeta and Kadcyla to target the cancer cells rather than affecting all cells indiscriminately. Oncologist Dr Daphne Tsoi says by giving patients this particular combination of drugs early on in their illness, they are likely to have a better chance of survival. “Both of these drugs have shown to be effective in helping patients with advanced breast cancer to live longer and feel better,” says Dr Tsoi. “We give them to patients after surgery as a “safety net”, in what we call a “mopping up” process,” says Dr Tsoi. For more information about trials at the MOCTU, please contact: oncologytrials.murdoch@sjog.org.au or 08 9366 1172.